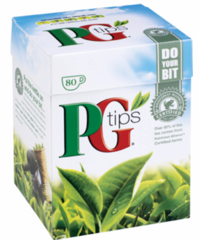 PG tips is a brand of tea in the United Kingdom, manufactured by Unilever UK, which claims Britons drink 35 million cups of PG tips a day. In the 1930s Arthur Brooke launched PG Tips in the UK tea market under the name of Pre-Gest-Tee, suggesting that the tea could be drunk before food was digested (pre-digestive). Grocers quickly abbreviated it to PG.